Do you sometimes assume that someone with the name of Goldstein is Jewish or that someone who is Asian has to be aggressive to be successful? 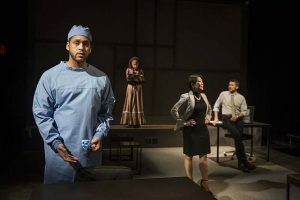 In ‘Smart People,’ now playing at Writers Theatre in Glencoe, playwright Lydia R. Diamond has four people, a black man, black woman, white man and an Asian woman, interact in Cambridge, MA. Both issue raised here did occur. All are ‘smart people’ but they each encounter stereotypical problems with others and with each other when play and pursue their careers. The time is between 2007 and 2009 with the Barack Obama campaign and win in the background.